Discussion in 'Tone Zone' started by happy_tom, Aug 14, 2006. I have this insane project in my head for a while. 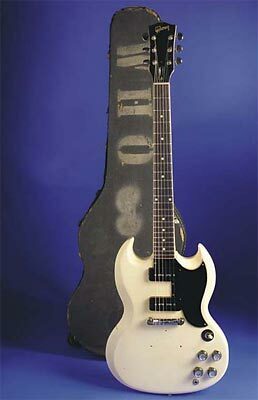 I'd like to make a ''sort of 61-65 SG special polaris white replica'', and have a couple of questions for experts. I'd really like to have sg with soapbar P90s, but with a small pickguard. and do the easy and cheaper modifications to make it look like gibson as much as possible (wraparound tailpiece, correct tuners... ...but I wouldn't bother with the difficult stuff like binding and the headstock shape). Now, what worries me is glueing different types of wood together, since I don't have pieces of mahagony lying around in my house. and does anyone see any potential problems over some time, like cracks where the cavities would be filled, etc. well, stripping a poly finish for a refinish is very very hard to do. Not hard, just very time consumming. Use polyurethane glue, then it won't matter what wood you put in it. I'd go through the trouble to get mahogany though, just to make it more 'real'. Soundwise, you wouldn't notice the change in tone caused by the wood having been glued in as the pups will cause a much bigger change than the wood will. And I'd think something very strange would have to happen to cause cracks. Seems like a very cool project. I wouldn't do it if it were your only guitar as will take a while to do right.